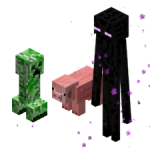 As of iDisguise 5.7.1, you can disguise both players AND living entities. To disguise a living entity, you need to know its Entity ID (EID). When you type /odisguise and press the [TAB] key to retrieve completion suggestions, iDisguise will suggest the EIDs of all living entities nearby you (radius of five blocks). As of iDisguise 5.8.1, you can also use the vanilla selectors to select both players and entities. You will find more information in the Minecraft Wiki.